Springfield Mall Shooting Report Was An Argument — Springfield Police received a report 1:05 p.m., today, Oct. 20 of gunfire at the Springfield Mall (Pa.). They said the matter occurred in the parking lot near Baltimore Pike and involved two groups who had an argument inside. No one was hurt and police are still investigating, according to the Department. 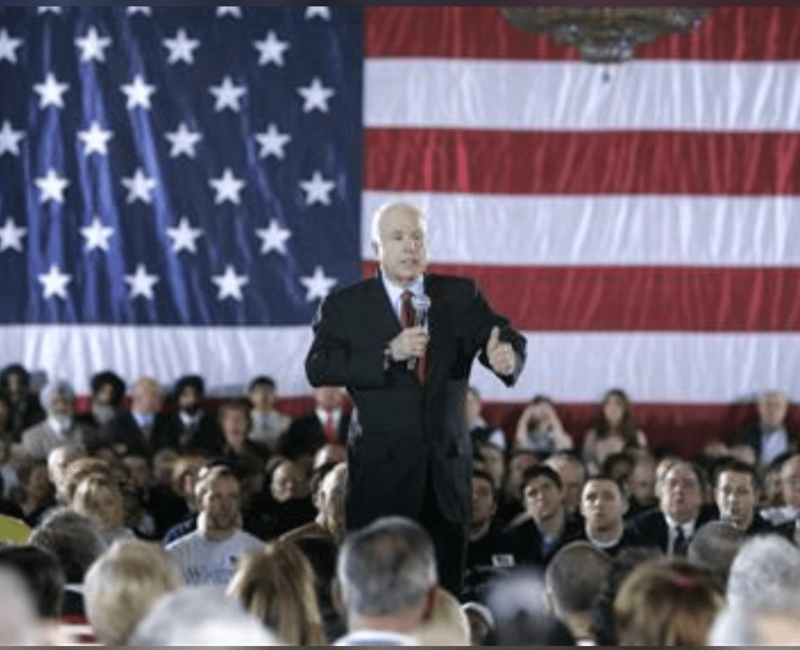 Senator John McCain Started 2008 Campaign In Springfield, Pa. Senator John McCain, Rest In Peace — If you haven’t heard Sen. John McCain died today, Aug. 25, 2018. John McCain at the Springfield Country Club, March 14, 2008. (I did not take this pix). His death occurred 9 years to the day of that of Ted Kennedy. To McCain’s credit, Theodore Edgar McCarrrick will not be speaking at his funeral unlike that of Kennedy. John McCain shaking hands with congressional candidate Craig Williams in Springfield. Behind them is Mike Culp of Springfield. 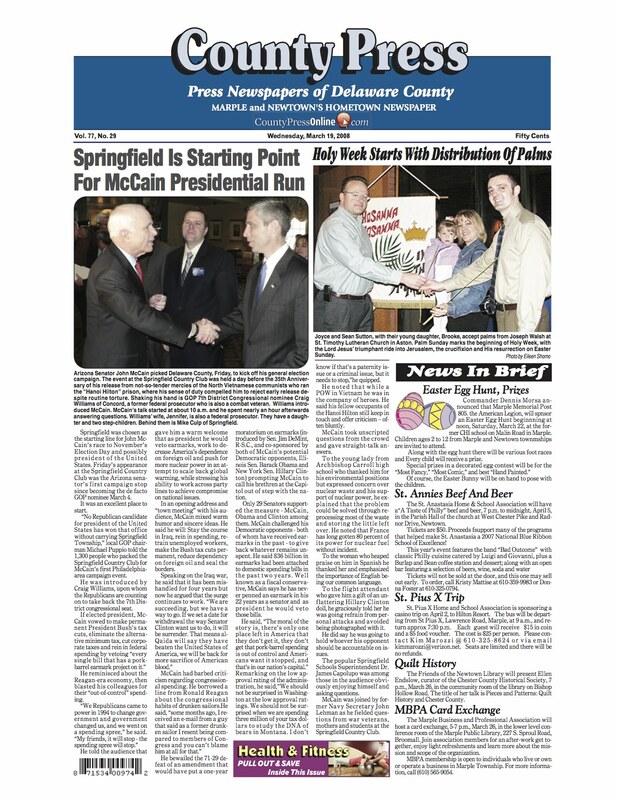 I actually liked McCain and remember him starting his 2008 presidential campaign at the Springfield Country Club. I walked in with a big camera bag and to my shock they just waved me through. I entered the spot for the national press pool photographers and stayed there the whole time — without credentials — despite their unfriendly comments. Security was not an issue. I could have smacked him on his knee a dozen times. R.I.P. senator. I still wish you had won. Author BillLawrencePosted on August 25, 2018 August 26, 2018 Categories Obit, Springfield1 Comment on Senator John McCain Started 2008 Campaign In Springfield, Pa.
Alex Charlton Pro Life Endorsement Untrue? Alex Charlton Pro Life Endorsement Untrue? — A controversy has erupted as to whether Alex Charlton is being supported by the Pennsylvania Pro-Life Federation as is being claimed in his campaign literature. 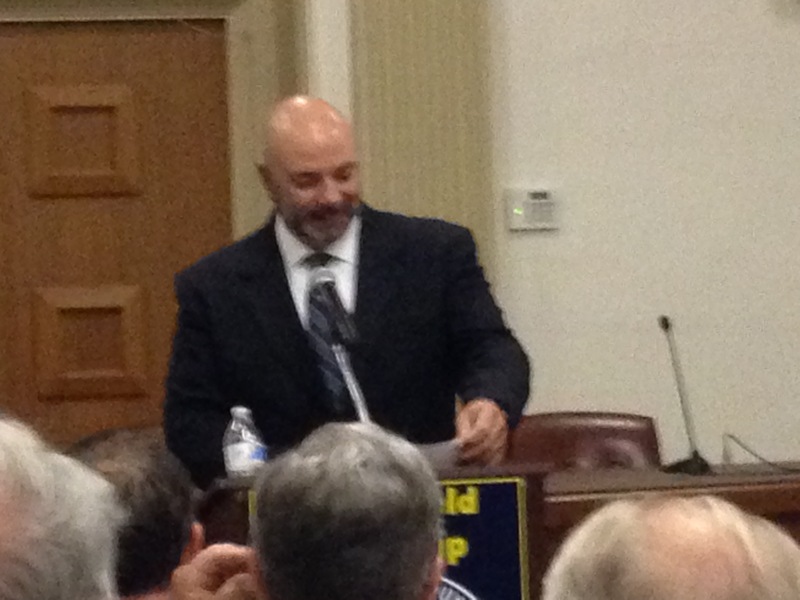 Charlton is the incumbent representative for the 165th District in the Pennsylvania House. He is facing retired math teacher and Springfield resident Regina Scheerer in Tuesday’s (May 15) primary election. Charlton has angered many activists for his strange opposition to mild bills that would curtail the cronyism rampant in this state. What really inspired Mrs. Scheerer’s campaign, however, was a meeting she attended by several persons including Father Anthony J. Costa, who is pastor of Saint Francis of Assisi Church and Father John Gabin who is pastor of Holy Cross Church, both in Springfield, to discuss Charlton’s Dec. 12 vote against SB 3 . SB 3 would have limited abortions in Pennsylvania to the first 20 weeks of pregnancy rather than the existing 24. Liberal Sweden bans them at 18 weeks while most of the rest of Western Europe bans them at 12 weeks. Charlton was only one of six House Republicans to vote against the bill which passed both chambers but was vetoed by Gov. Wolf. At the meeting, Charlton reportedly defended his vote with vigor saying he does not know where life begins and that dismemberment abortions are not the norm. That vote, however, was cast on April 16 long after Mrs. Scheerer received 900 signatures to get on the ballot much of it due to Charlton’s position on abortion and some observe that the qualifier “solely” arguably makes the bill meaningless. Anyway, last week, Charlton again strongly promoted a claim of being pro life. A constituent letter from State Sen. Tom McGarrigle, his former boss, specifically cited Charlton as being “supported” by the influential Pennsylvania Pro-Life Federation. Those affiliated with Mrs. Scheerer’s campaign have said they have been in contact with the group’s legislative director Maria Gallagher, who, they say, claimed never to have spoken with McGarrigle and that her group has not endorsed Charlton. An email has been sent to Ms. Gallagher for clarification and we await. Author BillLawrencePosted on May 12, 2018 May 12, 2018 Categories Abortion, Election 2018 Primary, Springfield8 Comments on Alex Charlton Pro Life Endorsement Untrue? 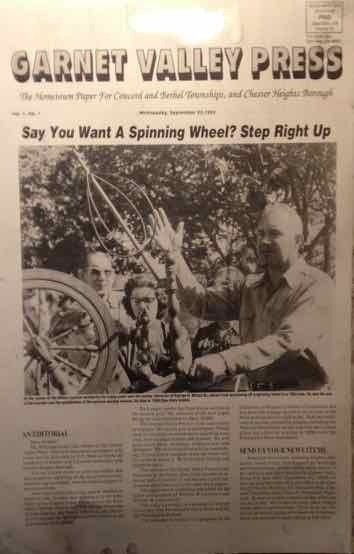 Press plate for the first edition of the Garnet Valley Press, Sept. 23, 1992. Springfield Press County Press Are No More — The death of a long-established newspaper is a sad thing but what might be even sadder is when there is no place to put the obituary. We have been told that the Springfield Press, established in 1931; the County Press which traces its origin to the County Leader established in 1932; the Garnet Valley Press founded in 1992; and the News of Delaware County, which traces to the Upper Darby News which if memory serves also started in the 1930s, are no more. All were weeklies serving Delaware County in suburban Philadelphia. They have been consolidated by Digital First Media, the corporate owners of Delaware County News Network, into something called the News and Press of Delaware County. Brian Murphy at a customer’s. 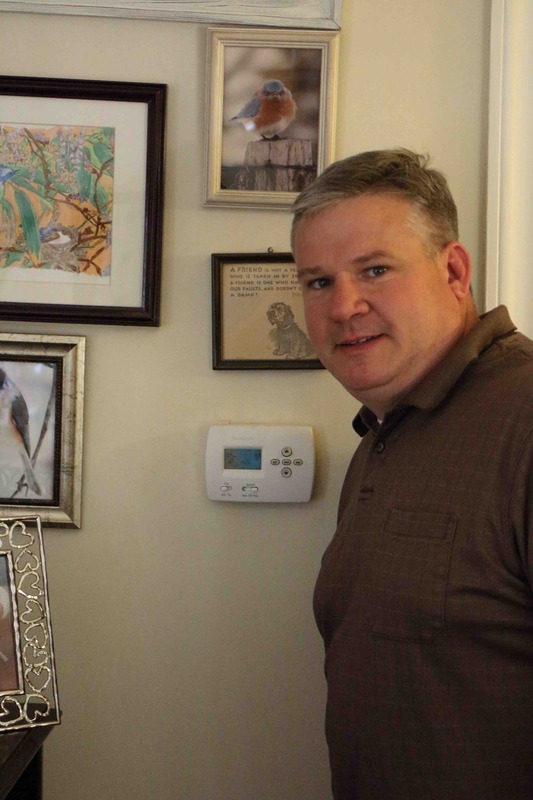 A Springfield man’s plan is already shaving thousands from plumbing, heating and air conditioning costs for homeowners throughout Southeast Pennsylvania and it’s just a few months old. Brian Murphy, a master plumber, began MyBidPortal.com earlier this year. The concept is simple. A homeowner fills an online form about the kind of work desired. A MyBidPortal representative consults with the homeowner by phone, online or via an at home visit. A system is selected and the rep then requests bids from local rated installation professionals. A professional seeking work sees the request on MyBidPortal and submits a bid. Once MyBidPortal gets multiple competing bids the homeowner is contacted. The homeowner compares the pricing with the latest MyBidPortal score and picks a pro. The bidders are blind to each others offers. Murphy says these pros are screened either by himself or one of his 11 agents before being allowed to submit bids on MyBidPortal, and their work is reviewed quarterly. The screening and reviews include interviews with their previous customers, ensuring that licenses and insurance are up to date, and observing them at job sites. Customers are not charged for work requests. MyBidPortal takes a small percent of the fee from the contractor when the bid is accepted. Murphy says savings for customers are often $4,000-plus for major jobs. Advantages to the contractor include far less idle time and far less expensive leads and sales commissions. Among the ways Murphy has been promoting his business is with how-to videos YouTube which can be found here. Murphy has been doing plumbing and HVAC work for more than three decades. With the growing success of MyBidPortal in his line, he says he is working with his wife, Holly, to expand the concept to retail. Charlton Opponent Submits 900 Signatures — Regina Scheerer, the retired teacher who is taking on incumbent State Rep. Alex Charlton, delivered nominating petitions containing nearly 900 signatures, Friday, to the Pennsylvania Bureau of Commissions, Elections and Legislation. Only 300 signatures are needed. Unless there are some bizarrely major issues (shenanigans), expect to see Mrs. Scheerer’s name on the ballot for the May 15 Republican Primary. Charlton was elected to represent Pennsylvania’s 165th District in 2016 replacing long-time incumbent Bill Adolph. Since then, he has time and again poked his constituents in the eye. He has opposed commonsense reforms aimed at curtailing vote fraud. He has endeavored to maintain the corrupt system that lets money be automatically deducted from the paychecks of public employees to pay for politicking. This politicking often involves supporting things that the employee opposes. He has refused to fight for pension reform. Did you know that there is someone in this state getting a $477,591 public pension for which you are on the hook? Alex certainly should. Alex has avoided the fight to abolish the Prevailing Wage mandate which could shave $25 million off the price of the $125 million Springfield High School project. Why does Alex want to inflict this burden on his elderly neighbors living on fixed incomes? The final straw for Mrs. Scheerer, though, came Dec. 12 when Alex voted against limiting abortions to the first 20 weeks of pregnancy rather than the existing 24. He was one of six Republicans to do so. Civilized people understand that failing to protect weak and helpless life lead to nihilism and despair. Most of Western Europe bans abortion — with some strict exceptions — at 12 weeks. Note, this would be 12 weeks gestational age which would be about nine weeks after conception. Even hip, progressive Sweden and Norway ban them at 18 weeks gestational age. Alex, however, who ran as a pro-lifer, thinks that’s too oppressive. For the record, Mrs. Scheerer says she will not take the legislative pension. Charlton Gets Primary Opponent –Regina Scheerer has announced that she will be taking on incumbent State Rep. Alex Charlton of the 165th District in the Republican Primary. Mrs. Scheerer is a retired middle school math teacher. 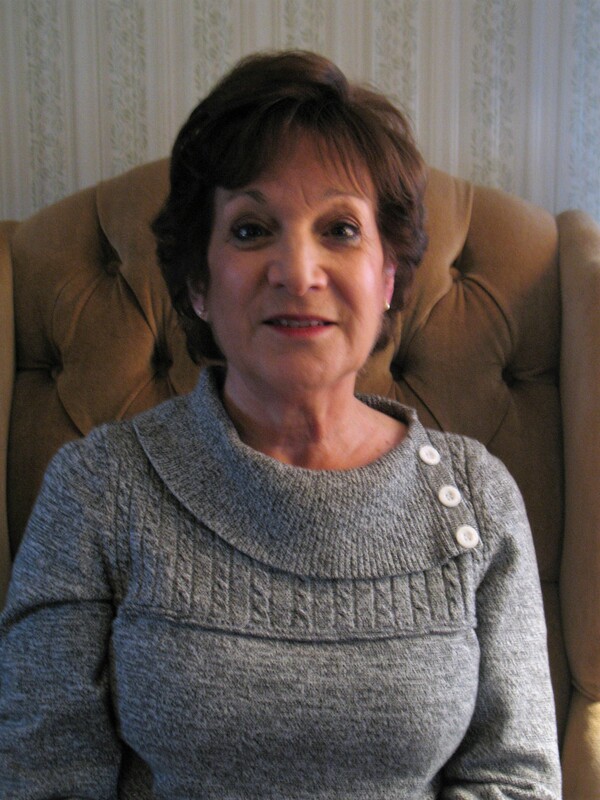 She has lived in Springfield for 40 years and has 12 grandchildren. Charlton’s vote against a bill that would limit abortions in Pennsylvania to 20 weeks — the present limit is 24 weeks — was the final straw for her albeit there was much leading up to it. Dear Neighbors and Friends in Springfield—I will be challenging our State Representative Alex Charlton in the upcoming May Primary on May 15. First I must get my name on the ballot. In order to do that, I need 300 valid signatures of registered Republican voters in Springfield, Marple and Radnor Townships, and Morton Boro, on petitions to be circulated starting next Tuesday, February 13 and ending on Wednesday, February 28. Since signatures on petitions may be challenged, and therefore voided, we need 600 signatures altogether. I need volunteers to go to registered Republican voters in their neighborhoods to collect these signatures. I will give you a list of the Republican voters in your neighborhoods along with instructions. An alternative to going door-to-door would be to host 20 – 30 registered Republican voters at your house for an hour, I would come to speak to them and then they would sign the petition. A combination of both may work for you also. He recently voted against a bill that would have limited abortions in PA to 20 weeks (5 months) gestation, which is more than half the time of a woman’s full term pregnancy. It would not have taken away a woman’s right to an abortion, but it would have lowered the allowable time in PA from 24 weeks to 20 weeks. 16 other states have already adopted the 20 week limit. 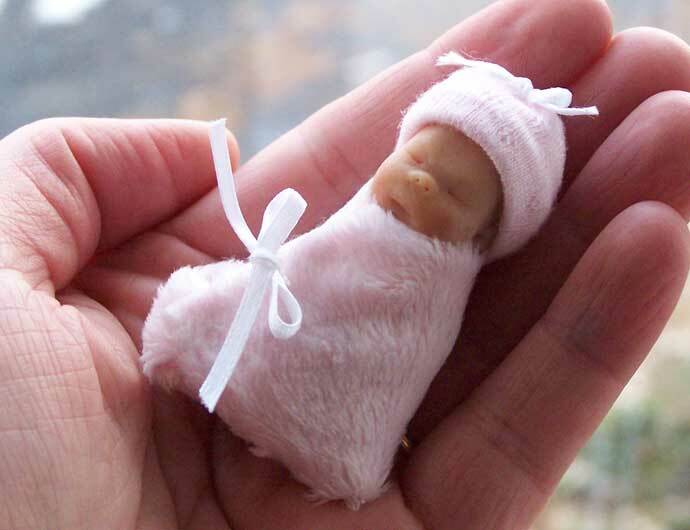 The bill also would have banned the barbaric practice of dismemberment abortions. A Delaware County Republican representative has never voted against a pro-life bill. Alex Charlton’s pro-abortion vote is incompatible with the Republican Party and incompatible with those who respect Life. Rest assured, I will not be a one-issue candidate. There are other issues directly affecting PA taxpayers; one, that is especially impacting Springfield School District taxpayers with the building of the new high school, is the required “prevailing wage”. SEPTA Eagles Parade Schedule — SEPTA has announced significant adjustments for service on Thursday (Feb. 8) for the Eagles Super Bowl Parade, according to State Rep. Alex Charlton (R-165). Free rides will be offered on the Market-Frankford and Broad Street lines, but service will be limited to select stops. Regional Rail will board only at select stations and will service only select stations in Center City. Customers MUST have either a Weekly or Monthly TrailPass, an Independence Pass, or a pre-purchased senior/reduced fare ticket. Discounted Independence Passes will go on sale today (Feb. 6) for $10. Please see http://www.septa.org/eagles for complete information regarding service on Thursday. That’s great Alex but couldn’t you have told us that all stations are open on the Route 101 and the trolleys will be running every 15 minutes? And, more relevantly, what are you doing about ending prevailing wage and shaving up to $30 million off the cost of the new Springfield High School? Springfield Mall Evacuated — We have just been informed (3:42 p.m.) that the Springfield Mall in Delaware County, Pa. has been evacuated. The parking lot is filled with police and firefighters and a fire ladder has been placed to the roof. Traffic is snarled on Baltimore Pike and Sproul Road we are told. The cause of the evacuation is reported to have been a grease fire in the kitchen of Sbarro’s restaurant.